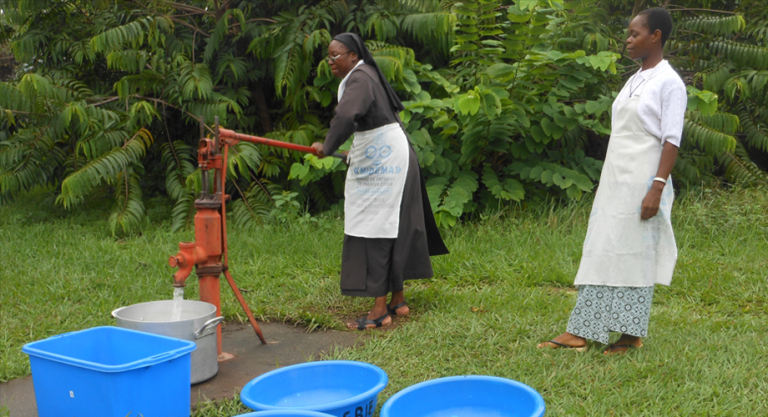 A contemplative community of religious Sisters in the Democratic Republic of the Congo (DRC) praying for persecuted Christians worldwide will have their future ensured by a new well – after a chronic shortage of water threatened their survival. “We didn’t know how we were going to survive after the collapse of our old well a year ago,” Sr Mahele Mwamini, the Prioress of the Discalced Carmelites at the Glorious Saint Joseph Convent, Kinshasa, told Catholic charity Aid to the Church in Need. ACN responded to the Sisters’ urgent request by providing a grant to enable them to deepen the well so it reaches a new water source. During this 2017’s dry season the well will be extended by another 100 feet (30 metres) to a new depth of more than 160 feet (50 metres) to ensure reaching enough water to supply the convent’s needs. She said: “Previously we did sell a few vegetables, this was to help the community be more self-sufficient and support unemployed mothers and their children including with their school fees. The lack of the water from the well made it difficult for the Sisters to bake Eucharistic bread and to maintain their small farm.